This popular state park is located on the historic Pendley Homestead, a historic apple farm. The family came to Arizona in 1907, and acquired the land through the homestead act of 1910. Frank L. Pendley invented an innovative system of irrigation (still in use today), which allowed him and his kin to thrive in Oak Creek Canyon, where others had struggled to survive. The park is named for the slippery creek bottom where crowds of people go to swim and slide down smooth rock chutes. Surrounded by red rock, and the green forest of Oak Creek Canyon, Slide Rock is a characteristic local in the Sedona area, and in the midst of Arizona’s sweltering summer, the water beckons. As suggested by the description above, the swimming here, besides being in a beautiful place where the weather is perfect, has extra appeal due to the smooth rock formations that form the stream bottom. This slick stone allows visitors to use the creek like a natural waterpark, frolicking in pools, and slipping down the rock chutes like slides. In theory, this is a great place to go, but there are a couple key issues that I personally have with this destination and both of them stem from the sheer amount of people that are drawn to this place during the summer. First and foremost, there are times (especially during the summer weekend) when it is hard to even make into the parking lot of Slide Rock, and people resort to parking along the highway and then walking to the park. Furthermore, and perhaps more importantly, due to the amount of people using this area, the creek has to constantly be monitored for bacteria levels, and there have been times when the park closed due to the high levels of E. coli in the water. The State Park has attempted to alleviate this trend by building a restroom mere feet from the water, but that doesn’t seem to be convenient enough for people as the trend of low water quality has continued into last summer. 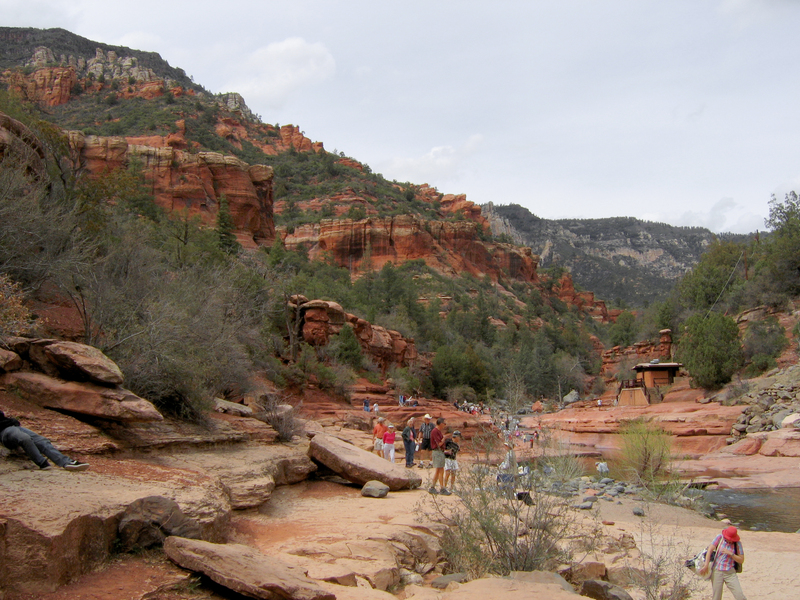 For these reasons, I typically find other ways to explore Oak Creek Canyon, but for those of you who decide to visit this area, do remember the impact that people can have on the water quality here, and please do your part to keep Arizona clean.